"Tell me how much time I have." Columbia Pictures has finally released the trailer for White House Down. This is definitely one Summer Blockbuster I'm looking forward to seeing this year. 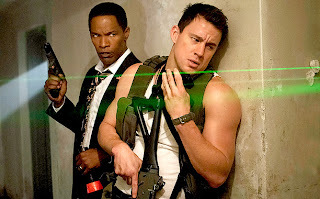 Channing Tatum pulls out the big guns (per usual) as he sets out to protect the President of the United States of America (Jamie Foxx) from a paramilitary group who takes over the resident of 1600 Pennsylvania Ave. This looks pretty rad even if it's directed by action mastermind Roland Emmerich. But hey, I was a fan of Independence Day, so... Anyway, take a look and enjoy! 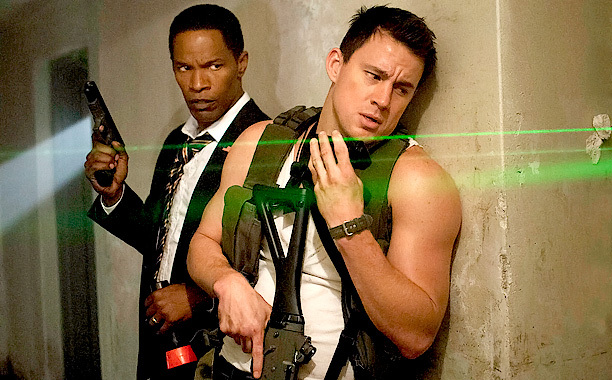 A Secret Service agent (Channing Tatum) is tasked with saving the life of the President of the United States of America (Jamie Foxx) after the White House is overtaken by a paramilitary group. White House Down is directed by Roland Emmerich (Independence Day, Godzilla, The Patriot, The Day After Tomorrow, 2012, Anonymous) from a screenplay written by James Vanderbilt (The Amazing Spider-Man, The Losers, Zodiac). This movie is suppose to be an action-thriller to rival the likes of Die Hard. Maggie Gyllenhaal, James Woods, Jason Clarke and Richard Jenkins also star in the film. Be sure to check it out on June 28th. Ooo, a fun combo of disaster/saving the president movie! I always love those. well if the movie blows at least we can feast our eyes on some nice eye candy. Yum!